OUT! He's done it, Joseph gets his sixth wicket. MI win by 40 runs. FOUR! Not the best of the decisions taken by Hooda in the field. Committed himself a little too early and what could have been kept down to two has resulted in a boundary. Was full delivery outisde off and Pollard slams it down to long on. Falls just ahead of Hooda and makes an error in judgement of getting his body behind the line of the ball and leakes another boundary. OUT! Chahar got a little too overambitious as he tried to slog it on the legside, looked very ugly there as he didn't read the slower one was through his shot only to get an edge to wicket-keeper. His little cameo comes to an end. Bhuvi has a wicket. DROPPED! Was the slower delivery wide of off stump and Pollard had to reach for it. He goes the extra cover but doesn't get the distance. Rashid hares across the turf but isn't able to get his dive right and hold onto the catch. OUT! Struck hard and flat but straight to the man in the deep. Rashid Khan has his man! Spreads his arms as if to say 'What have you got, now?' Rashid just altered the length touch, and it wasn't short enough for Hardik to pull it completely. It was a half pull of sorts and thus was able to get the elevation. Smart bowling. Mumbai have lost another big wicket. OUT! Misery continues for Mumbai Indians. Ishan Kishan has been run out. Kishan tapped the ball on the offside and set off for a single, Pollard sends him back after he was halfway down the pitch. Wicket-keeper Bairstow disturbed the stumps way before collecting the ball but he made sure even though there weren't any bails left, he uprooted the stumps. Great take first up and then fantastic presence of mind by the YJB. Tough luck for Ishan Kishan, who was set having played 21 deliveries. OUT! Kaul bounces out Krunal. Clearly undone by the surprise shot ball there Krunal. Kaul bend his back to bowl the effort ball, which hurried onto Krunal as he was late on the hook. The bouncer got big on him and he could only get a top edge for wicket-keeper Bairstow to pouch simplest of catches. OUT! Looked like Quinton de Kock got a good piece of that but holes out as he finds the one fielder placed on the leg side. Kaul bowls it on the leg stump and De Kock whipped it straight down Hooda's throat at deep midwicket. MI losing their way. They haven't even gone past 50 and have lost their top three. OUT! Suryakumar Yadav goes the sweep and has missed it completely. It was the knuckle ball that Sandeep Sharma bowl, holding the ball only from his fingertips. Loud shout for leg before and it is given. Yadav challenges the call and there was no problem with the pitching...the impact is umpire's call and hitting the wickets is also umpire's call as the ball according to ball tracking half of the ball would have hit the top of off stump. 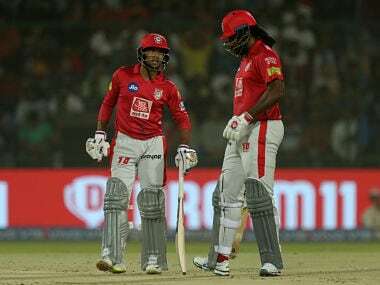 MI do not lose their review but Suryakuamar Yadav has to walk back. MI in big trouble here. OUT! Mohammed Nabi comes into the attack and has struck almost straightaway. Tossed up delivery, held it slightly back and Rohit saw an opportunity to milk it to midwicket boundary slight bit of turn and Rohit couldn't nail the pull, ends up giving an easy catch to deep midwicket. Big wicket!! DROPPED! What has happened there? Rohit charges down the wicket and goes for an ungainly swat across the line and gets a thick outside edge that goes high in the air. Siddarth Kaul has put down a sitter. Oh dear, more agony for Sunrisers. Kaul does get under the ball but seems to have lost it in the lights. The light towers at Rajiv Gandhi stadium are low and this tends to happen. Barely manage to get his fingers to the ball. Sunrisers Hyderabad team: David Warner, Jonny Bairstow (wk), Vijay Shankar, Manish Pandey, Deepak Hooda, Yusuf Pathan, Mohammad Nabi, Rashid Khan, Bhuvneshwar Kumar (c), Sandeep Sharma, Siddarth Kaul. SRH announce an unchanged XI. Regular skipper Kane Williamson still out of the team due to fitness issues. Two changes: Yuvraj Singh replaced by Ishan Kishan. Alzarri Joseph makes his debut, taking the place of Lasith Malinga. CSK with a good win in the afternoon game against Kings XI Punjab, getting back to the winnng ways after loss to Mumbai. But the second game of the night became a fairytale one for a youngster from West Indies, who ended up taking six wickets on his IPL debut, grabbing the best bowling figures in the tournament's history. Mumbai Indians get another two points and move up the ladder. Tomorrow we are set for another double-header. RCB host DC at M Chinnaswamy Stadium in Bengaluru in first game and then we head to Jaipur where RR play KKR. We will catch you back again at 4 PM tomorrow. For now, good night. It's a dream start. I was trying to back myself and bowl to the plans. I was told to keep it simple, bowl to my plans. I knew we had a game to win and I focussed just on that. The boys are playing well and putting in the hardwork. Rohit Sharma, Mumbai Indians captain: Very, very pleased. I thought 136 wasn't a great batting effort, but we held our nerves, kept them guessing and stayed in the game. Sensational bowling effort from Alzarri. To come out and play like that, shows what he's has done in the past. His confidence in playing CPL and West Indies has brought him here. We didn't bat well to start with. We kept losing wickets. We knew it wasn't a 170-180 pitch. But it was under the covers before the match started so it was a bit sticky. So we knew anything around 140 would be good, because we have quality in our bowling. Bulk of the runs have been scored by their top order, not that their middle order is not good but they haven't had much of chance. So we wanted to exploit that. We don't want to be a team who starts off poorly, we want to win games at the start, because we know how difficult it can get towards the end.We needed characters to step up - today was a perfect day for Pollard. Played a crucial knock in getting us to 136 and then Alzarri along with the other bowlers too who chipped in for us. Six for 12! Those were Alzarri Joseph’s figures as he engineered a colossal collapse by Sunrisers Hyderabad and Mumbai Indians’ massive 40-run victory in a low-scoring game. His feat earned him the best figures by an IPL debutant (improving on six for 14 by Sohail Tanvir). From 33 without loss in the fourth over, Sunrisers Hyderabad sank to 96 all out in 17.4 overs. The win lifted Mumbai Indians to the top half of the league table behind Chennai Super Kings, Sunrisers Hydrabad and Kolkata Knight Riders. The 46 not out off 26 balls by Kieron Pollard knocked the wind out of the home bowling but it really was Alzarri Joseph’s hostile bowling that set up such an easy win. Bhuvneshwar, SRH captain: I think it started off when we started dropping catch. It could have been easy chase had we applied ourselves. It's difficult to captain with bowling but with experienced players, it becomes easy. When we go into the next match, we will try to improve. The mayhem continued and the Sunrisers Hyderabad crumbling batting stood exposed under pressure as Jasprit Bumrah sent back Mohammad Nabi for his first wicket of the night. Moments later, Alzarri Joseph completed a five-for by beating Bhuvneshwar Kumar with pace. It has been a terrific performance by the debutant who took the field in Lasith Malinga’s absence and showed that he read the track well, getting the ball to bounce and with good pace to make life difficult for the home batsmen. Bumrah back on. Bowling in these last few overs has been a routine for him now. He knows what to do. Slower ones, yorkers. He does everything. Has removed Nabi. Mumbai inch closer to victory. Hyderabad need 46 runs in 18 balls. Alzarri Joseph has all but stolen Mumbai Indians team-mate Kieron Pollard’s thunder by taking his fourth wicket on debut, having Rashid Khan caught and bowled with the delivery after dismissing Deepak Hooda. He welcomed the Afghanistan batsman with a short-pitched delivery to which Rashid Khan had no answer. The ball found the glove and ballooned for Alzarri Joseph to complete the catch on his follow-through. Joseph comes back on. This has been a brilliant show by debutant Joseph. He has given others a lesson or two on how to perform on an IPL debut. Four wickets, including the big one of Warner, for just 7 runs and he is not finished yet. Did not get his hat-trick but would be satisfied. He has been sharp, intelligent and athletic. Bhuvneshwar joins Nabi. They need 48 in 24 balls. Still achievable but momentum is with Mumbai. Alzarri Joseph kept adding more wonderful memories to remember his IPL debut by when he gained another scalp, bowling Deepak Hooda off the inside-edge to virtually draw the curtains on Sunrisers Hyderabad’s aspirations of securing a fourth successive win. The West Indian paceman’s third wicket drove the home side further back while taking Mumbai Indians closer to a well-deserved victory. As expected, Bumrah back into the attack. Off-cutters are back in business. Typical of Bumrah as he starts his final spell of the night. Nabi gets six off the last ball and it was much-needed for SRH. Keeps them afloat in the game. But as history suggests, Bumrah will get better and better from here. Hyderabad need 53 runs in 30 balls. SIX! Last ball of the over, back of the length, slow in pace, does not matter for Nabi, who makes room and clears long-off by a good distance. Sunrisers Hyderabad have a mountain to climb – a certain Jasprit Bumrah will possibly bowl three of the last six overs when the home team need to score at more than 10 runs an over. All is over bar the shouting? 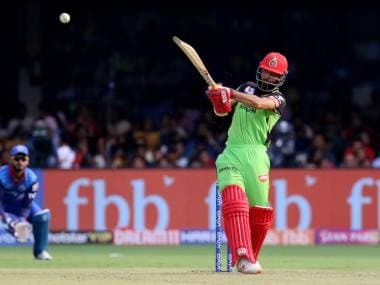 There is no doubt that Deepak Hooda and Mohammad Nabi have not been able to even rotate the strike freely against a charged up bowling Mumbai Indians attack that is being backed superbly by their fielders. Chahar now finishes off. What a spell from him too. 21 runs in 4 overs and two wickets. More pressure on SRH after the end of 14th over. Boundaries are now hard to come. Bumrah will be back soon. He has three overs left. Hyderabad need 61 runs in 36 balls. Behrendorff completes his quota and he bowled really well. 28 runs in his 4 overs and 1 wicket. Rohit Sharma should be happy with this wicket. Boundaries have dried up for SRH. Wickets continue to fall. A small chase has become an uphill task. They need 64 runs in 42 balls. 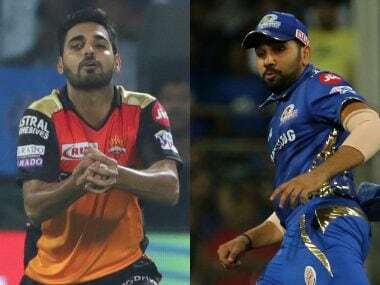 Mumbai Indians, apparently down at 97 for seven in their innings before Kieron Pollar’s blitz in the last two overs infused a fighting spirit, forced Sunrisers Hyderabad to stare down the barrel of a gun when Yusuf Pathan was dismissed by Rahul Chahar to a top-edged catch at square-leg. With half the side back in the hut, Sunrisers Hyderabad will reckon that it is Mumbai Indians’ match to lose from hereon. Deepak Hooda will have the Afghan hitters, Mohammad Nabi and Rashid Khan’s company to pull the rabbit out of the hat now. Rahul Chahar strikes for MI. Pathan has perished and the middle-order of the home side has been exposed here. Chahar almost had another wicket in the over had Rohit Sharma been more alert and agile in the slips. Anyway, MI on top at the moment. Hyderabad need 69 runs in 48 balls. FOUR! This boundary has come after a long time, short from Chahar and Hooda, rocks back and cuts it away for a boundary. Sunrisers Hyderabad have gone more than four overs without a boundary hit. They have scored only 20 runs since then and lost two wickets. Mumbai Indians bowled and fielded with belief that they can stop the home side from reaching the target. That pressure saw Manish Pandey pull a short ball from Jason Behrendorff to Rohit Sharma inside the circle. Mumbai Indians know that they have to contend with strokeplayers of the caliber of Yusuf Pathan, Mohammad Nabi and Rashid Khan. Behrendorff back on and he has delivered straightaway. Manish Pandey takes the long walk back. Great catch from Rohit. The ball travelled really fast to him and he managed to hold on to it. Yusuf Pathan joins Hooda in the middle. Very important innings for Pathan as well keeping in mind his recent form. Krunal continues. He is bowling tight line and lengths. Manish Pandey and Hooda are usually slow starters and while Mumbai may take a breather here, they can't let the two settle down. 5 run has come in this over. Hyderabad need 78 runs in 60 balls. Pandya junior into the attack. SRH may have lost three key wickets but they are still in this. They need 83 runs in 66 balls. This is also an opportunity for their middle-order to come good in a stiff chase. We got into time-out. Krunal Pandya brought into the attack. MI have started off well and would the slow bowlers to continue the good work. Krunal has begun well. 4 off the over. The sinewy fast bowler Alzarri Joseph boosted Mumbai Indians’ hopes of taking full points from their trip to Hyderabad, despite bowling with a smallish total, by claiming his second scalp. He dismissed Vijay Shankar. He had sent back David Warner with his first delivery and in the following over, he came up with an effort ball that saw the Sunrisers Hyderebad batsman want to send it on orbit. He only managed an outside edge to point where Hardik Pandya held the catch. Joseph has removed Shamkar and SRH innings has been derailed a bit here. Joseph doing it easily here. What an IPL debut it is turning out to be. 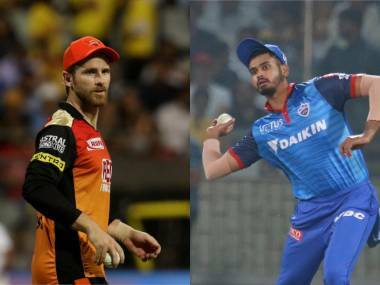 Sunrisers Hyderabad’s Indian batting mainstays, Vijay Shankar and Manish Pandey, face an interesting challenge after Mumbai Indians used the power play overs to send back the dangerous opening combination of Jonny Bairstow and David Warner to claw their way back in the game. Rahul Chahar and Alzarri Joseph infused belief in the Mumbai Indians ranks with a wicket each. It could have been worse for the home side had Kieron Pollard not dropped Manish Pandey in the sixth over. Shankar lobs the ball up in the air after an inside edge, which then deflects off his pad. DROPPED! Pollard spills an easy chance at long off to give Pandey a reprieve on 0. To make matters worse for Mumbai, Shankar collects a boundary off the fourth delivery. Six off the over. Alzarri Joseph announced his arrival in IPL by bowling David Warner, the most productive overseas batsman in the history of the league, with his first delivery. Sunrisers Hyderabad’s left-handed opener paid the price for not waiting to see if Alzarri Joseph was bowling with nerves for company. He dragged a ball from outside the off-stump to his wicket to give the young fast bowler a memorable present. Alzarri Joseph dismisses David Warner off his very first delivery on IPL debut. Finishes with a wicket-maiden. Cannot think of a better start to one's stint in a league. Mumbai back in the game, with both SRH openers back in the hut. Rahul Chahar comes into the attack and the spinner has struck for MI. Bairstow has been removed. This is a huge wicket for the young spinner. MI in business now. IPL 12 Match 19 SRH vs MI at Rajiv Gandhi International Stadium in Hyderabad: MI win by 40 runs.A fairytale debut for Joseph who has taken six wickets in this hame. Madness in Hyderabad and the home team is absolutely shaken, This one pitched on good length and shaped away, taking the edge off Kaul's bat, travelled to keeper. 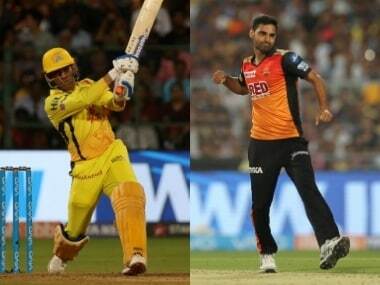 IPL 2019, SRH vs MI, Today's Match Preview: Sunrisers Hyderabad (SRH) and Mumbai Indians (MI) lock horns at the Rajiv Gandhi International Stadium in Hyderabad in the second game of the Saturday double-header, right after the match between Chennai Super Kings (CSK) and Kings XI Punjab (KXIP). 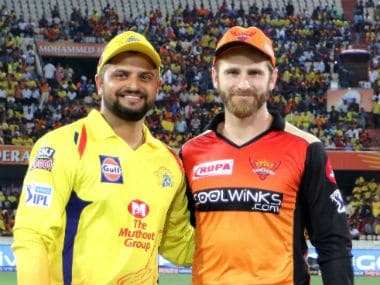 Both teams pulled off victories in their previous outings — MI halting CSK's winning run with a 37-run win at the Wankhede Stadium, with SRH posting a five-wicket victory in an away game against Delhi Capitals (DC). MI were powered to a competitive 170/5 after being asked to bat first by CSK skipper MS Dhoni, thanks mainly to the fireworks provided by Krunal Pandya, Hardik Pandya and Kieron Pollard down the order after a steady knock by Suryakumar Yadav. Chennai lost wickets at regular intervals during their chase, and were always behind the required rate, eventually finishing on 133/8. Much like Mumbai, Hyderabad were able to tie Delhi down to a sub-par 129/8 thanks to a disciplined effort from their bowling attack. Jonny Bairstow led the way for the Sunrisers with a solid 48, and although the visiting side lost a few wickets in the second half of their innings, they eventually got home with more than an over to spare. Mumbai Indians Team 2019 Players list: Rohit Sharma (capt), Jasprit Bumrah, Hardik Pandya, Krunal Pandya, Yuvraj Singh, Kieron Pollard, Lasith Malinga, Rahul Chahar, Ben Cutting, Pankaj Jaiswal, Ishan Kishan, Siddhesh Lad, Evin Lewis, Mayank Markande, Mitchell McClenaghan, Alzarri Joseph, Jason Behrendorff, Anukul Roy, Rasikh Salam, Anmolpreet Singh, Barinder Sran, Aditya Tare, Suryakumar Yadav, Jayant Yadav, Quinton de Kock.